We have what we call the Euro Fund at home. 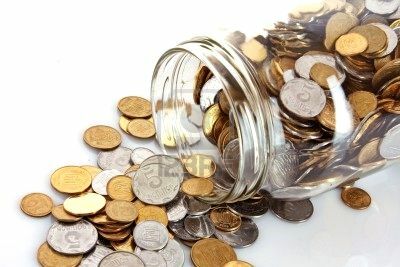 In the kitchen by the stove there’s a glass jar and every time the kids find a penny or a coin they drop it in the jar. Every time they have to pay a small “fine” for not doing a chore it goes in the glass. Every time I find coins in the washing machine or in pants’ pockets they go in the jar. Then, before we leave for Europe, the kids count the change and divide it up between them. It usually adds up to enough money for them each to buy themselves a couple of souvenirs. The kids feel proud that they “earned” the money and made a contribution to our trip. They also contribute to the bigger Euro Fund. I have an account where I deposit birthday money or Christmas money that I get, or cash I earn from odd jobs. (Like participating in focus groups, or Panda Research, or whatever – I love that kind of mad money!) But how my son and daughter participate is, if they see a coupon in the newspaper and cut it out for me, or spot a sale item or a store discount that I can use, I deposit the value of the coupon or discount into the Euro Fund. This adds up rather quickly and the kids get a lot of satisfaction knowing they are helping to reach our goal. It becomes a family motivated effort that's fun at the same time. That's a great idea that I might have to incorporate (i.e. steal) into my life, that is if I can stop using the money to buy shoes or handbags. :) I particularly like using the value of a coupon or discount. I think it's a great idea to have kids contribute to a vacation fund! WOW! What a great idea for ANYTHING, but I adore the idea of traveling Europe with the kids. I have always wanted to go and planned on backpacking before I had kids. Well, that never happened considering I got pregnant in high school... Sadly, I had it in my mind that I'd finally be able to go once we retire. This is so encouraging... can't wait to read more! Following back now!